When Apple announced the newly designed MacBook Pro with Retina Display (rMBP) at its Worldwide Developers Conference in June, many marveled at the power and speed that a completely custom design could bring. 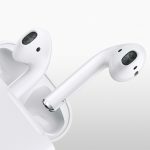 As Apple customers slowly stepped out of the “reality distortion field,” however, some were concerned that upgrading such a tightly-integrated beast would be impossible. 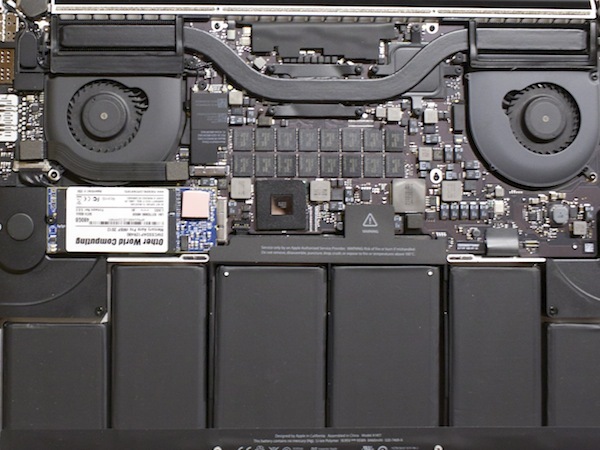 Shortly after its release, tear-downs of the rMBP revealed both good and bad news: RAM was soldered to the system, and would not be user-upgradeable, but the internal SSD, despite its custom design, was removable and potentially upgradeable. About two months after the rMBP’s release, Other World Computing (OWC), a longtime member of the Apple community and the first to release upgrades for many Macs with non-industry standard parts, released the Aura Pro, the first and thus far only third party SSD for the rMBP. Currently available in a single 480 GB capacity, the Aura Pro promises to increase rMBP storage speeds and provides a nice upgrade path for users who initially purchased their rMBP with a stock 256 GB drive and are now looking for more space. 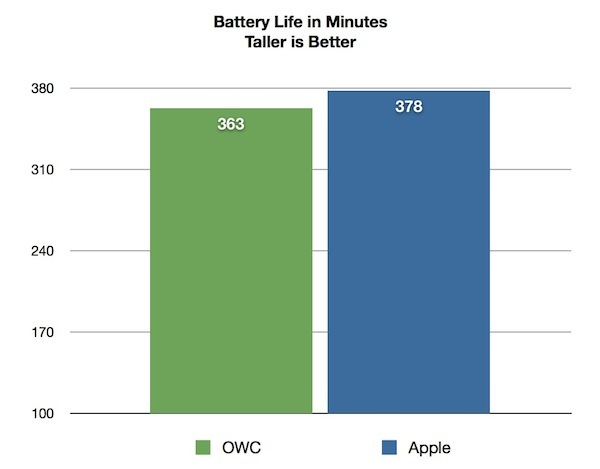 As mentioned above, OWC has been serving the Apple community since 1988, and they follow Apple’s “it just works” mentality. Along those lines, the company includes all the tools you’ll need to perform the installation. 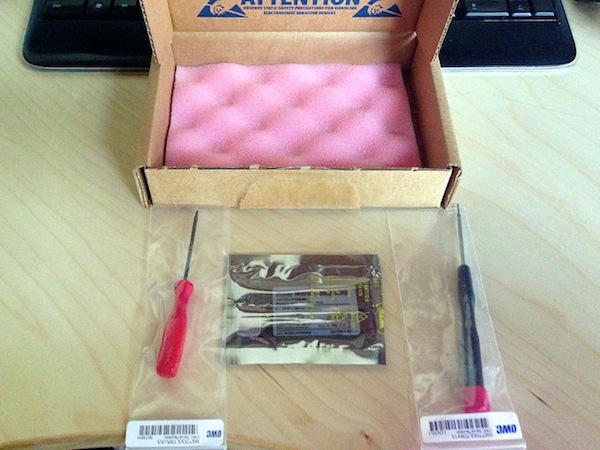 In this case, that’s a Pentalobe driver for the case screws and a Torx T–5 driver for the screw that holds the SSD in place inside the rMBP. The Aura Pro’s 480 GB capacity is less than that of Apple’s 512 GB SSD, but for a good reason. The Aura Pro actually contains 512 GB worth of flash components, but 32 GB is used for real-time data redundancy and error correction, leaving 480 GB of usable space. The flash memory used by OWC in the Aura Pro is synchronous NAND, as opposed to Asynchronous NAND. This configuration syncs reads and writes with the SSD’s controller, allowing greater potential bandwidth than the standard SATA III bus. Unless you wish to start with a clean install of OS X, most users will want to clone their existing drive contents over to the new SSD. This can be done in several ways. Clone directly to the new SSD. The SSD in the rMBP is a custom design, so most external enclosures won’t allow you to simply plug the drive in and connect it externally. Luckily, OWC will soon offer the Envoy Pro, an external enclosure designed to accept the custom rMBP SSD (Reviewer’s Note: OWC is offering to ship an Envoy Pro for free, once they are available, to every customer who purchases an Aura Pro SSD until September 30, 2012. After that, the Envoy Pro can be purchased separately for US$59.95). Before installation, insert the OWC SSD into the Envoy Pro, connect it to your Mac, and then use cloning software, such as Carbon Copy Cloner or SuperDuper to copy the stock internal drive’s contents to the new drive. Once the clone is complete, shut down the Mac, remove the OWC SSD from the Envoy Pro, and install it into the rMBP (discussed below). Clone to an intermediary drive. If the Envoy Pro is not yet available, or if you simply don’t want to buy it, you can use a third external drive as an intermediary drive. With this method, you’ll clone your drive to the intermediary drive, install the new SSD, then clone your data back from the intermediary drive to the new SSD. Connect a USB, FireWire, or Thunderbolt external hard drive to your rMBP. Launch Disk Utility and erase the drive (as long as its contents are backed up elsewhere) or create a new partition to receive the cloned data from your internal drive. Make sure both the external drive and any newly created partitions are as big or bigger than the internal drive you wish to clone. Launch your cloning software of choice and clone the contents of your internal drive to the external drive. Once complete, shut down your Mac and install the new SSD. After installation, reconnect the external drive and hold down the Alt/Option key at startup to launch the startup manager. Select the external drive from the list and boot to your cloned external drive. Once again, launch your cloning software and clone the contents of the drive to the newly installed SSD. With this method, you’ll still want to clone your drive to an external drive, but instead of cloning the data back, you’ll install a fresh copy of OS X and then use Apple’s Migration Assistant to copy back only your user data, applications, and settings. For users who need or desire a clean install, this is the best option for cleanly installing OS X system files while also preserving your user data. 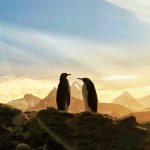 An in-depth walkthrough of Migration Assistant is beyond the scope of this review, but more information can be found at Apple’s support site. Once your data is prepared, installation of the Aura Pro SSD is simple for both novices and pros. OWC has excellent installation videos on its website, and anyone comfortable holding a screwdriver should be able to follow along. The primary recommendation during installation is to take precautions to avoid static electricity, which can irrevocably damage electronic components. In other words, don’t perform this upgrade in a carpeted room with low humidity while wearing socks. Remove the Pentalobe screws around the bottom of the MacBook Pro (make sure to keep them in order; the screws vary slightly in length and correspond to specific holes in the case). Remove the the Torx screw holding the stock SSD in place. Slide the stock SSD out by pulling it parallel to the chassis. 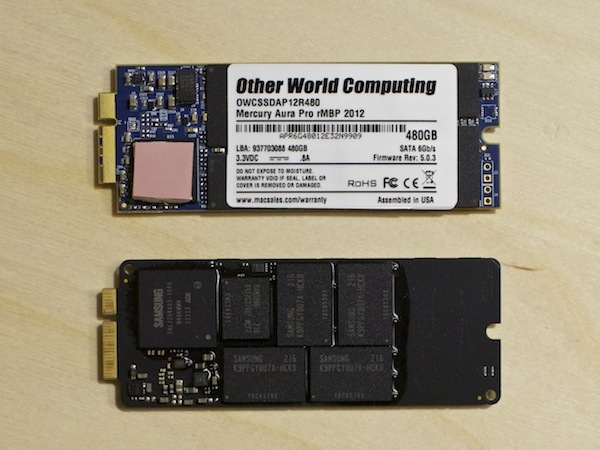 Insert the OWC SSD into the slot along the reverse path that you removed the stock SSD. Reattach the battery connector, replace the screws and power up the Mac. Upon your first boot with the new SSD installed, make sure to perform a PRAM reset by holding the Command, Option, P, and R keys on your keyboard simultaneously after your press the power button but before you hear the startup chime. Continue holding the four keys until the computer restarts and you hear the startup chime a second time. You can then let go and the Mac will boot normally. 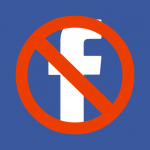 Depending on which method you chose to copy your data, discussed above, you will either be booted straight to your desktop or you will need to clone or migrate your data over. If you need to install a fresh copy of OS X, you can either use a USB OS X Installer or use OS X Internet Recovery. OWC claims that the Aura Pro can reach sustained reads of up to 501 MB/s and sustained writes of up to 503 MB/s. Looking at our tests on the DriveGenius Benchtest, OWC’s claims are no exaggeration. We reached sustained reads of 516 MB/s and writes of 486 MB/s. 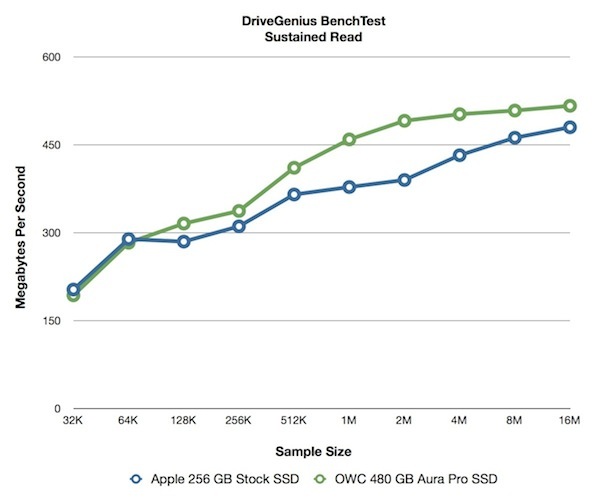 Depending on the sample size, sustained reads and writes on the OWC Aura Pro beat the stock Apple SSD by over 100 MB/s. The Aura Pro was also much faster and random operations than the Apple SSD. Throughout the tests, the Aura Pro was the clear performance winner at every measurement point. Wanting to make sure that the DriveGenius Benchtest was not providing false results, we also tested speed with AJA System Test. 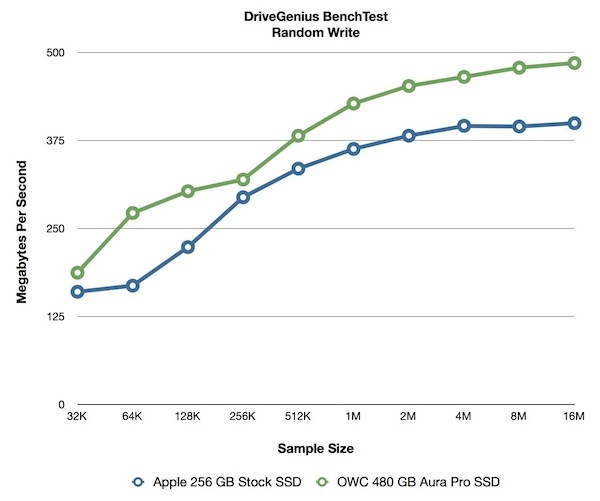 At every level, the Aura Pro outperformed the Apple SSD, by as much as 120 MB/s. We were also curious about boot times. 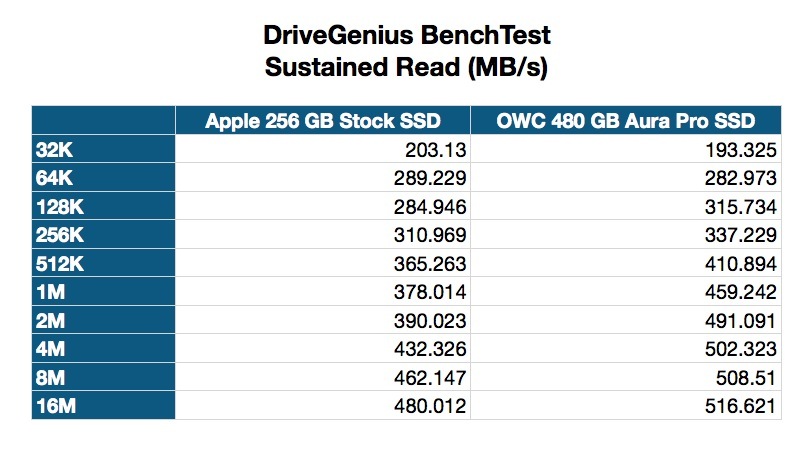 The rMBP already boots remarkably quickly, but could this ultra fast OWC SSD improve times further? 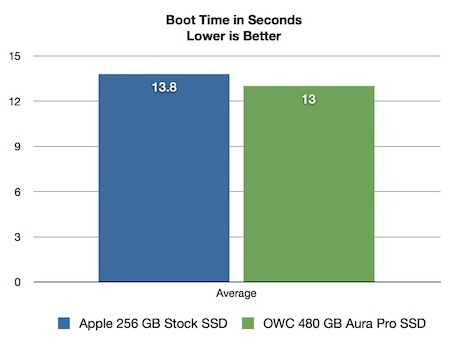 We timed five cold boots on both the Aura Pro and stock Apple SSD and then averaged the results. As the graph shows, the Aura Pro does boot faster, but only by eight tenths of a second. Still, it’s good to know that, thus far, there is no compromise with the Aura Pro compared to the Apple SSD. 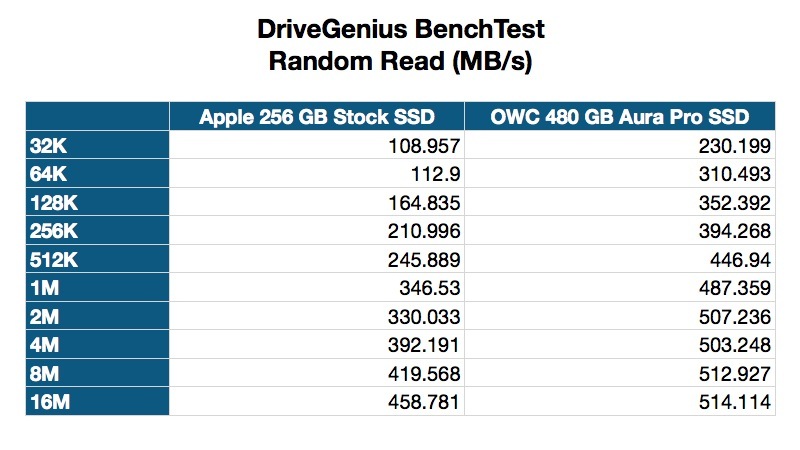 OWC makes great, high performance SSDs. But one area where they lag behind some competitors is power consumption. The company’s 2.5-inch standard form factor SSDs use quite a bit more power than some newer products from companies like Samsung. OWC claims that the Aura Pro uses 3 Watts while active, 1.2 W while idle. 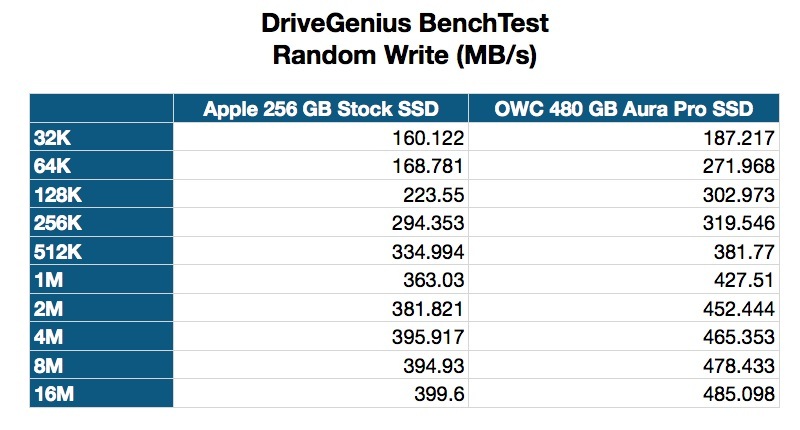 We don’t know for sure what the power consumption of the stock Apple SSD is so we ran our battery life test twice on each drive and averaged the results. 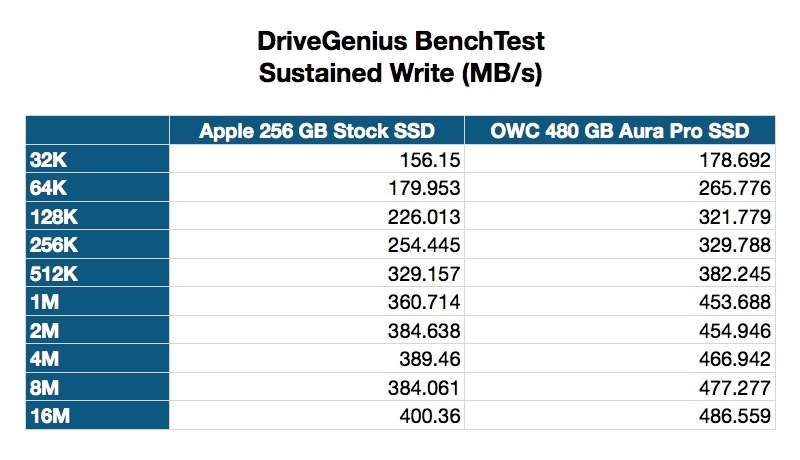 The OWC SSD does indeed use more power than the stock Apple SSD, but only by a slim margin. Running time on the stock SSD lasted 15 minutes longer than with the Aura Pro, a decrease of about 4 percent. The importance of this difference depends on each user’s individual needs. If you’re a mobile user who is in the field every day, 15 minutes could be the difference between finishing a project or not. 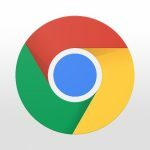 If your work or play depends on pure speed, however, the 15 minute difference is hardly noticeable compared to the potential to gain over 100 megabytes per second of additional performance. At US$579.99, the Aura Pro SSD seems at first glance to be quite expensive. 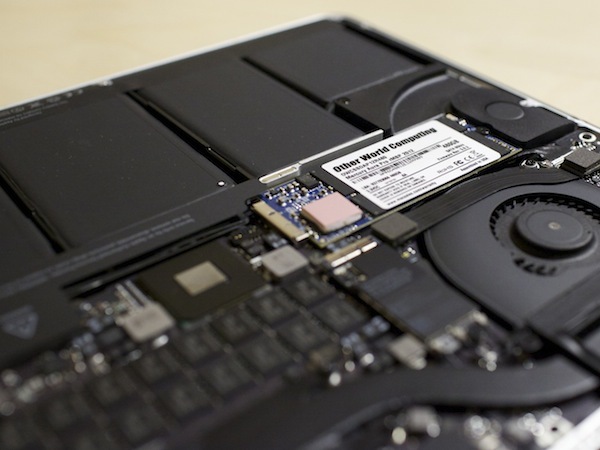 When compared to Apple’s prices for SSD upgrades, however, the cost becomes much more reasonable. The base price of an entry-level MacBook Pro with Retina Display is $2199.00. That price includes a 256 GB Apple SSD. For $500.00, you can upgrade to a 512 GB SSD, bringing the total cost of the machine, before tax, to $2699.00. Taking the base price of the rMBP ($2199.00) and adding an OWC Aura Pro SSD ($579.99), brings the total pre-tax price to $2778.99. That represents a total cost that is $79.99 higher than sticking with the in-house Apple upgrade. But that is not the end of the analysis. When a user upgrades their SSD via Apple’s online configuration order system, they only get the 512 GB SSD. 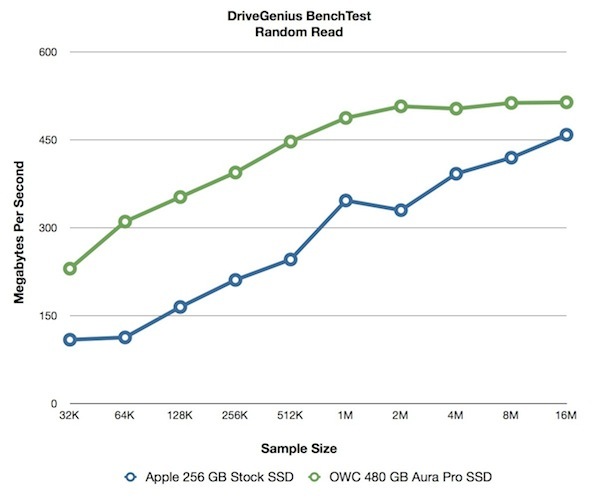 If a user purchases the stock rMBP and then buys the OWC Aura Pro, the user gets to keep both SSDs. The stock Apple SSD can be used in an Envoy Pro enclosure or just stored as a backup in the event of a drive failure. It could also be sold to other users once the rMBP becomes more prevalent or if Apple’s rumored 13-inch Retina MacBook Pro contains an SSD with the same form factor. 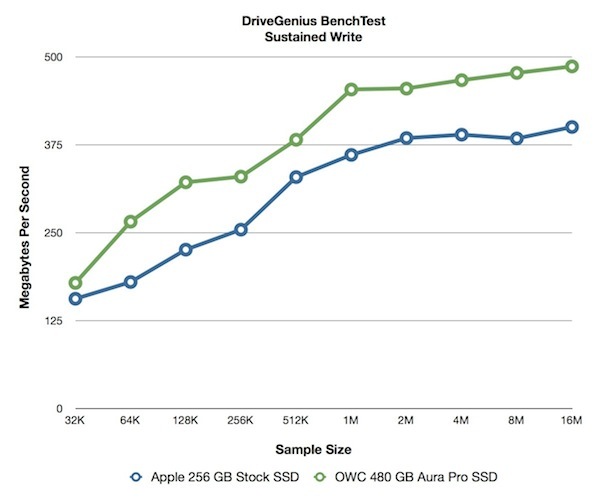 Considering the benefits of keeping both SSDs, and not forgetting about the substantial performance increase of the Aura Pro over the stock Apple SSD, OWC’s price premium of $80 looks to be much more appropriate, if not an excellent value. 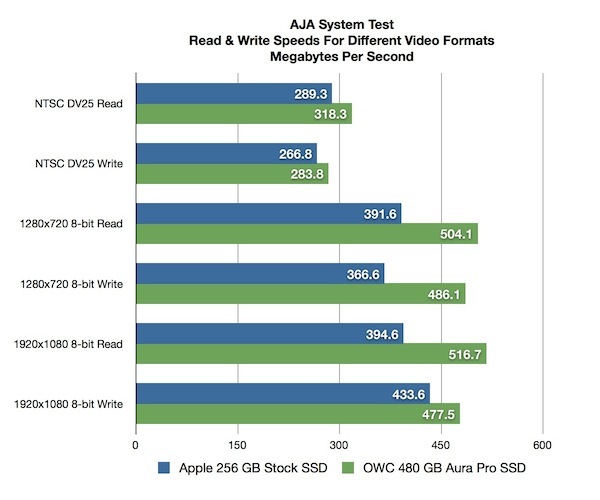 The Aura Pro SSD outperforms the Apple SSD in nearly every way. For rMBP owners (or soon-to-be-owners) who ordered a model with the stock 256 GB SSD, the upgrade to the Aura Pro is a no brainer if you need more capacity, speed, or both. For those who already paid Apple to upgrade their SSD to one of the larger capacities, the justification for upgrading is much lower. 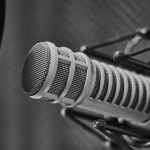 Only those users for whom storage processing and transfer time is money, such as on-the-go video or photo editors, will find enough value in the Aura Pro to justify the expenditure. Finally, if you have neither the need for additional drive speed nor capacity, the Aura Pro is an expensive upgrade that can’t be justified. It is, however, a great sign that future options for drive upgrades will likely be available when the time comes to upgrade down the road. The 480 GB Aura Pro SSD for the MacBook Pro with Retina Display is available now from Other World Computing for $579.99 and comes with a three year warranty. Faster than stock Apple SSD; large capacity; competitively priced compared to Apple's upgrade options; user keeps both OWC and Apple SSD; includes all necessary tools to perform the upgrade. Only one capacity and price; too expensive for some users.